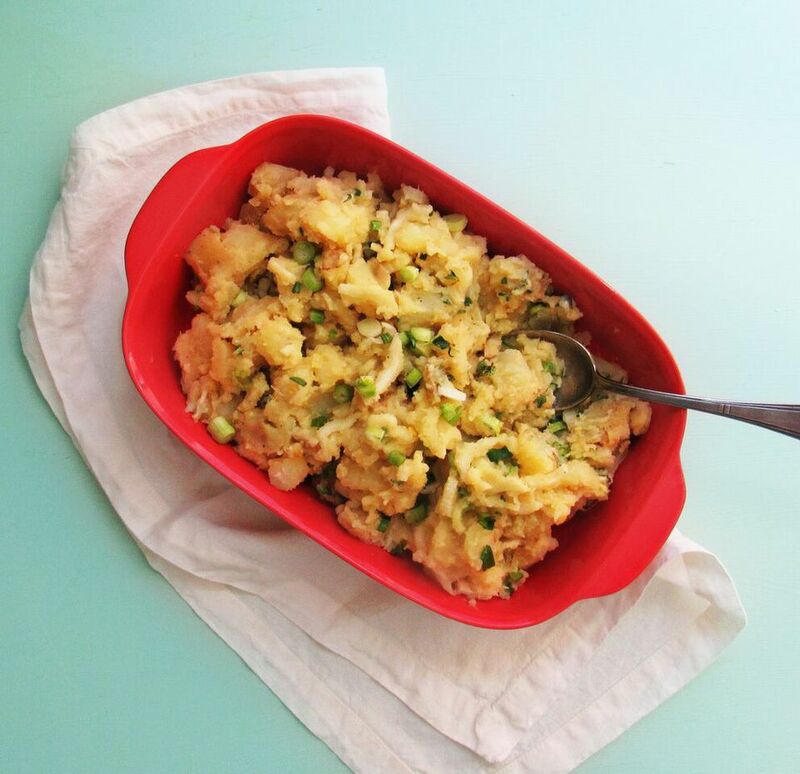 Sometimes you are looking for a mayo-free potato salad, either because you or someone in your family doesn’t like mayonnaise, or because you are serving it at a picnic, or another outdoor gathering, and you are not eager to leave a salad made with mayo in the hot sun. Either way, this one fits the bill. Leave out the white wine if you are concerned about the very small amount of alcohol for the kids. Peel or scrub the potatoes and cut them into 1-inch chunks. Place them in a saucepan with water to cover by 2-inches. Bring the water to a boil over high heat, reduce the heat to about medium, and simmer the potatoes gently until they are tender and can be pierced with a sharp knife. Drain and let cool slightly. Meanwhile in a large bowl, combine the olive oil, white wine (if using), Dijon mustard, shallots, and salt and pepper. Add the warm potatoes and gently toss until the potatoes are well coated with the dressing. Let cool slightly, then gently mix in the scallions and thyme. Serve at room temperature. -You can add other minced fresh herbs to the salad, such as oregano, thyme, chervil, marjoram, or sage. -Use red onion for an additional pop of color. -Thinly sliced celery also makes a nice addition, adding a bit of crunch. Use an age appropriate knife to slice the scallions, and chop the parsley (Tiffany add the kid knife from Amazon). Measure and mix up the dressing. Also if you want to cook the potatoes in halves rather than smallpieces, once the potatoes have cooled, the kids caan cut them up with a knife, now that they are soft. What are Yukon Gold potatoes? Yukon Gold Potatoes range in size, but have a great creamy texture and slightly buttery flavor when cooked. They have delicate yellow-colored skins, they can be cooked in almost any way imaginable. Leaving on the skin reserves preserves more of the nutrients. Look for firm, well shaped, fairly smooth potatoes. Avoid any green discoloration (which is caused by overexposure to light) which can result in a slightly bitter taste. Avoid any potatoes that show signs of sprouting, wilting, wrinkling or decay. Store in a cool, well-ventilated area rather than in the refrigerator. Try these other great potato recipes: Crispy Baked Sweet Potato Fries, Classic Potato Salad with Celery and Fresh Thyme, Mashed Yukon and Sweet Potatoes with Sauteed Leeks, and Smashed Roasted Baby Potatoes.